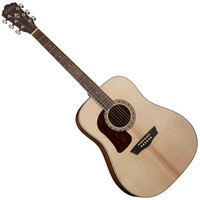 The Washburn Heritage Series HD10SLH Dreadnought Acoustic is a great live guitar and records really well too. Its perfect for strumming picking some blues or bluegrass flatpicking. The HD10SLH features a solid sitka Spruce top for superior tone that improves with age Rosewood back Mahogany sides and neck a 20 fret Rosewood fingerboard with white dot inlays and Rosewood bridge. The chrome die-cast tuners allow for quick easy and accurate tuning and the Washburn tortoise pickguard with custom rosette offer that classic Washburn style youve come to know and love. This entry was posted in Washburn and tagged Guitar-and-Bass. Bookmark the permalink.